One of the more annoying claims made by pseudoscientists is that because scientists are so specialized these days, that they cannot “see the forest for the trees” as the metaphor goes. But they, as outsiders, totally can and therefore show that all of science is wrong. Or something like that. It is true that sub-sub-sub-sub-sub-…-sub fields do exist, and these days that’s a manifestation of really how far we’ve come in science. Back in the day (say, 400 years ago), we knew comparatively so little that someone could study for a few years and get a good understanding of the state of human scientific knowledge. These days, you need an advanced degree to understand a sub-field of science, such as physics:optics, or psychology:adolescent (the colon indicating the sub-field). If you want to work in a field, you pretty much must specialize, otherwise you will never be out of school because you won’t know enough about that broader topic. But we always have to incorporate other fields of study, even if we don’t realize we’re doing it. I’ve tried to point out in my podcast and blog how tugging at one string by a pseudoscientist unravels so many other strings in unrelated subjects that it completely disproves their point about being able to have a broad knowledge base from which to draw new connections. But that’s a long-winded way to get to why I’m even talking about this. I’m home right now for a period of 10 days, between travel, and I’m using the time to convene a working group. A working group is sort of like a mini-workshop. Where a workshop, in science, tends to be a specialized conference convened where people give presentations meant more to explore a topic rather than to brag about their latest research. Last May, I convened a workshop entitled, “Workshop on Issues in Crater Studies and the Dating of Planetary Surfaces.” Succinctly, it was intended as a step back from the minutia we deal with to look at the original problems we were trying to solve, how we tried to 50 years ago, why we did it the way we did then, and what we’re trying to do now with craters and what outstanding problems we still have. I was able to bring in several founders of the field (since it really got going in the 1950s and 60s), and we addressed a wide range of issues. Among those was statistics. We’re doing statistics the way we did it in the 1970s, before we had computers and when people had to draw graphs in papers by hand. We realized that the field of statistics has changed considerably and the way we were doing things and are doing things is not necessarily completely correct, nor is it necessarily the best way. So, I also had money to bring in three statisticians to the workshop to learn. And this week, since five of us crater people who work in the Boulder area were at the workshop and are interested in bringing in this completely unrelated (but related) field of statistics into planetary geophysics, we’re holding a working group. The five of us, one of the statisticians who is local, and one of the statisticians who I flew in from Los Alamos. And it’s fascinating. If nothing else (because I’m sure no one reading this cares about statistics of crater populations), I find it fascinating to watch the interaction between the statisticians and the planetary scientists. We know some of our issues, and we are completely steeped in our language to describe it. They know stats, and they are constantly bringing in similar problems in other fields that are solved certain ways to see if it can apply. It’s taken a year to almost get on the same page just with what we mean when we talk about different graphs. And they sometimes come up with potential solutions, but then we say “no” because it completely misrepresents the physical situation. Today, after working all morning and being brought back up to speed yesterday, one of the surprising things that we (planetary scientists) had to grasp was that we may need to start thinking about craters – at least the population of craters, the ensemble – in a completely different way: Rather than discrete objects which we observe (with a definite location and size), think of them as a probability, where each observation is actually a distribution (albeit narrow). If we can do that, then we can bring in a huge field of well established statistics to deal with some of our fundamental problems with how we work with craters. Like simple things … like how we really should be assigning uncertainty to our measurements and results. And throughout this, there was the constant nagging question in the back of my head of how we’re going to convince the entire field that this is the proper way to go — if it’s the proper way to go. Fortunately in our working group we have one of the founders of the field, so if we can convince him, we can figure out how to write up the paper to convince others. Even in highly specialized disciplines, they must always be informed by and incorporate other disciplines, even in completely different fields (astronomy/geology:planetary-gephysics:surface-processes:impact-craters:crater-populations … meet mathematics:statistics:[huge list of stuff they’re bringing in]). Sometimes, to update a field of study and bring it in line with what’s known in others, you have to think of the problem in a completely new way, but one that remains informed by its roots and always in what we’re really trying to understand (as in, they can model whatever, but we constrain them by keeping it physically meaningful and realistic). There’s always inertia in a field of study, but there are always ways to bring about change if that change gets you to a more correct methodology or answer. This post is also my way of updating you all on what I’ve been doing, partially, work-wise for the past few days and why the podcast still hasn’t come out with a new episode in over a month. Over the last few days, I’ve been hunkering down due to the deadline for abstract submission to the premier planetary science conference, the Lunar and Planetary Science Conference. It’s held annually in March in Houston, TX. Everyone is allowed to submit up to two first-author abstracts, and I have, for the last couple years, done two. This year’s not an exception. I’ll post about my New Horizons -related one later. This post is about my abstract entitled, “Developing a Global Lunar Crater Database, Complete for Craters ≥1 km.” Because the file sizes have to be <1 MB, the figures are low resolution. There are many, many different purposes to conferences, though the primary is “communication with colleagues.” Within that are many different things, like talking about your research and getting ideas. Another is to be able to show colleagues what you are doing so that, if your name happens to come in, say, a grant application, they might just recognize it. For LPSC this year, my non-New Horizons abstract is in that category. I’m setting myself up for writing a grant later this year to build a lunar crater catalog that contains a lot of information about roughly 1 million craters on the moon. It’s been rejected for a couple years, and one of the underlying reasons is that I don’t know how many craters there are, therefore I can’t give a good, accurate work effort estimate to do all the information-gathering about each crater. This abstract is meant to answer part of that. I’ve been leveraging bits and pieces of funding from different sources over the last year to do the initial mapping part — identifying the craters and locating them and measuring their diameters. For this abstract, I’ve roughly 28% of the moon done. For the March conference, I’m hoping to be closer to 50%, and by the time the grants are due this autumn, 100% so I know how many craters I have to do more stuff with. Two more things I want to talk about in this slightly longer post. First is grunt work. Science is not easy. Science is rarely glamorous. Science is sitting down and 99% of what you do no one will ever know about because it’s only the results – not that big data-gathering process – that form the bulk of your paper. Methods sections are usually <25% of a paper because relatively few people care about that in comparison with your results. And trust me, sitting down and drawing circles for hundreds of hours on end is NOT glamorous. But the results are cool. Second is why we care – why are the results "cool." One reason is that it just looks cool — seeing all those dots that indicate a crater, and seeing all the patterns that emerge tell us a lot about the different history of those areas of the moon. The main one is ages (more craters = older). But we can also do things like better understand what's hit the moon in the past, and hence what is likely to hit Earth in the future. We can study different materials even, which is why the second figure is devoted to permanently shadowed regions where there might be water (areas that never see the sun act as cold traps for water molecules). Anyway, this is turning out longer than I wanted, so to wrap it up … that's one thing that has been occupying a lot of my time over the last few days. One down, one to go. In my Part 1 of this lengthy series of probably 11 posts, I talked about the machinations of Terry Hurlbut, one of the primary editors of Conservapedia and (I think) the founder of the incredibly ad-rich Conservative News and Views website that espouses über-right wing ideals and young-Earth creationism. He said that Pluto is red therefore it’s rusty therefore it formed from material ejected from Earth during Noah’s Flood. In a follow-up post, Terry followed the same protocol as before, grabbing onto one tiny finding, saying it’s impossible to explain with modern science, therefore Pluto was launched from Earth during the Flood. In this case, the finding was carbon monoxide (CO) ice, found in the “heart” area now informally known as Tombaugh Regio. Terry explains this by saying that during the Flood, Pluto and Charon formed by material ejected from Earth, which heated as they contracted, burning the plant matter that was also ejected. The gases released from the burning plants included CO, which fell as “rain” onto the surface of Pluto in what he claims is a basin that is now Tombaugh Regio. Okay, I know I try to avoid ad hominem attacks on this blog, but I had to fight my brain to type that last paragraph. It’s so ridiculous, that unless one actually is familiar with Terry’s writings on his own sites and elsewhere, one would think it’s a really bad Poe or Onion article. Terry tries to emphasize in his article that neither NASA, SwRI, nor JHU/APL (the three institutions involved in the mission) have tried to explain the CO ice. Therefore, we don’t know now and therefore Terry’s idea is the only one out there. The thing is, we don’t have all the data taken yet. The data we do have is lossy-compressed. And scientists by their nature are very cautious about publishing hypotheses about something without doing a lot of tests of those hypotheses. AND within the mission itself, there’s the situation that it’s better to put out obvious findings now and save the possible interpretations later once we have more time to look at the better data and talk with more people and amongst ourselves. Put in that context, it’s perfectly reasonable to expect that NASA would put out the press release about unambiguous findings of concentrations in one area of Pluto of CO (as in we found it, it’s in ice form, and it’s concentrated in one particular area) and have that be the press release, rather than add unnecessarily to it several possible models to explain it but “more data are needed, stay tuned several months until we get that data to test it.” That’s kinda a downer to close out a press release. In a perhaps more mainstream young-Earth creationist venue, the Institute for Creation Research also has a take on the New Horizons mission. Jake Hebert wrote their article, “New Horizons, Pluto, and the Age of the Solar System.” It is a fascinating read if one looks at it from the standpoint of starting with one topic and twisting it into something completely different to argue against in a no less wrong way than most other creationist writings. New Horizons went to Pluto. Secular scientists are going to tell a materialistic story without a deity about it but aren’t saying that so’s to avoid offending the taxpayer. That means we don’t understand how the solar system formed. New Horizons will yield information about Kuiper Belt Objects. Insert everything that creationists have written about comets over the years that they think shows comets prove the universe (or at least the solar system) is less than 6000 years old. Not only is it a strawman argument on their part, but by equating Pluto with comets means not only that everything THEY have written about comets over the years applies, but also everything that scientists – such as myself – have also written that thoroughly debunks their arguments applies. For a taste of these, I refer you to my blog (post 1, post 2, or post 3) and/or my podcast (episode 3). Rehashing all those ideas here is gratuitous and a waste of space. And, there’s a reason why those are some of my earliest blog post and earliest podcast episode: They’re simple to debunk. [S]cientists have found far fewer craters than they expected. […] Being far from the sun, Pluto ought to be very cold and hence not have experienced recent volcanism. Any primordial heat would have long ago dissipated, if the solar system were 4.5 billion years old. [… T]here ought not to be any significant geological activity sufficient to remove craters on Pluto’s surface. Compounding this problem for a 4.5-billion-year age for the solar system is the fact that Pluto is located in a particularly crowded part of the solar system. […] Therefore, Pluto ought to be undergoing impacts today at a higher rate than most other objects in other portions of the solar system. Planetary scientists who are committed to belief in a 4.5-billion-year-old solar system are at a complete loss to explain the lack of craters on Pluto. First, Pluto does not have ZERO craters. It has many; it’s just Tombaugh Regio that has no unambiguous craters in the region that we’ve seen with the lossy JPG artifacting covering it. That means it likely has no craters >10 km in diameter, meaning it could still have plenty that are smaller. Second, the whole way we get our crater chronology starts from the moon (which Danny acknowledges, and he actually gives a reasonable overview of the subject). We do see heavily cratered areas of Pluto. So if we see some areas that have a huge number of craters relative to other areas, it just means that the one with few craters (or maybe none) is much younger. How much younger, though? If Danny wants to say that the heavily cratered areas are 6000 years old, does that mean that the “heart” region of Pluto was created yesterday? Again — see the Venus blog post. To bypass some more of the quote and get to the last statement, this is common among creationists: God of the Gaps. Set up a scenario and say someone can’t explain something and then say GodDidIt. Except, we have plenty of ideas of why there may be no craters over some parts. One of the main ones has to do with the second argument (in three paragraphs): The atmosphere. It’s tiny, but it cycles. Pluto is tilted almost like Uranus, except more. So for 124 years we have one pole facing the sun, and for 124 years the other. During this time, it’s likely that the ices on the surface near the sunward pole sublimate (turn from solid to gas) and some get deposited on the pole that’s in night. This gives you a “surface” that is literally no more than a hundred years old. In fact, going into this, I was warned that several models predicted that there may be very few craters on Pluto simply because of this process, of not only ices being deposited as many, many layers of frost, but also because when they sublimate, they are removing that surface that had been cratered! So some predictions going in were that Pluto may have a few very large, shallow craters, but nothing else. Obviously that’s not the case, Pluto is more interesting, but to say that we “are at a complete loss to explain the lack [not!] of craters on Pluto” is bullocks. Here is the second argument that Danny made: Pluto is outgassing nitrogen, and therefore it’s young because it is a body of finite size and because there should be some activity that releases the nitrogen. Yes, Pluto was found to be outgassing molecular nitrogen gas. Though “outgassing” is the wrong word here — perhaps an honest mistake, but it’s wrong nonetheless. It’s that nitrogen gas is escaping from the surface, not being outgassed from below the surface (that we know of). So this is a classic creationist argument: Take the current rate for something, multiply it by 4.5 billion years, and claim it’s impossible. They do that with Earth’s moon. But in this case, Danny didn’t even do that simple math, even if it is wrong (the current rate may not be what it was in the past). 500 tons per hour means very roughly 2*1019 kg over 4.5 billion years. Pluto is 1.3*1022 kg. That means it would have lost a mere 0.15% of its mass due to nitrogen escaping over 4.5 billion years if the current rate has been the rate for 4.5 billion years. The third argument has to do with the very tall, 3.3 km high mountains observed on Pluto, where Danny argues that if Pluto is warm enough to have geologic activity to account for those first two things, it can’t be cold enough to support ice mountains. The mountains are interesting. I don’t even remember if there are solid ideas yet in the team as to how they may have formed, but this is yet another example where scientists look for something to explain an observation, and creationists leap to GodDidIt. Regardless, though, both of the prior two arguments can be explained at least in part by atmospheric processes rather than geologic, therefore this is moot. Finally, he argues that Charon has fewer craters than expected, and a large chasm, therefore it’s young, too. Problem if we take this approach: How can Charon be older than Pluto? If we’re using the metric of craters (and incorrectly per the standard young-Earth creationist), and Charon has more than Pluto, then Pluto is even younger than 6000 years old, right? What is he trying to say here, that Pluto formed a few minutes before Clyde Tombaugh discovered it? I’m also not quite sure where he’s getting that Charon has fewer craters than expected. I don’t remember this being discussed, but it’s possible I missed it. A lot of the issue for Charon (and Pluto, for that matter) is our ability to identify craters in these images. Most imaging is with the sun almost directly overhead. Meaning we can’t pick out craters very easily. Especially when all we have is lossy, JPG-compressed images. Think of photographing the full moon of Earth and then compressing it to 100 kb to send to your grandmother who’s running Windows 95 with a 56k modem. Not easy. Charon probably has more craters than Pluto (no atmosphere). But our ability to find them right now is significantly hindered. That in mind, I’ve already identified a few hundred. Same on Pluto. I’m going to shift a bit here, though the next two posts on this topic are already planned (though Sharon over at Doubtful News just pre-empted me tonight on the Crrow777 stuff that’s hit Newsweek). Instead of discussing pseudoscience that I’ve seen elsewhere, I’m going to discuss my own. Not pseudoscience, per se, but where science can go wrong when you have little sleep and are under extreme pressure to do things quickly. I generally study impact craters (among other things). One of my primary science areas of research for the Pluto-Charon system is to understand their crater populations to tease out what the impacts are like out there 40AU from home and what the geologic history of the bodies are. To do that, you have to map craters. I’m going to be focusing on that in the coming months (and currently) and I’m also going to be focusing on how our mapping changes as we start to get lossless data and higher pixel-scale data (not higher “resolution,” for “resolution” means number of pixels, while “pixel scale” refers to the length per pixel). This latter focus has been something I’ve been publishing on in the last year. As I’ve mentioned before on this blog, images right now are being sent down lossy compressed. Meaning they are full of JPEG artifacts that wash out a lot of small features … like impact craters. So when mapping, I’m assigning a subjective confidence level that indicates how certain I am that a feature is a crater or not. Since we have repeat imagery, already, I’m going over each area multiple times, blindly, with the different images. One area that’s hit the news is Sputnik Planum, on the “left” side of the bright albedo feature Tombaugh Regio. It’s bright, and it’s young, and we know it’s relatively young because it has no unambiguous impact craters in the images that we have so far. I’m very careful with that phrasing: unambiguous impact craters in the images that we have so far. Except, I thought I found one. A rather large one. But I didn’t. When I initially mapped it in the image that came down a week ago (the full-frame image that was unveiled the morning of the encounter), I gave it a confidence level of 4 out of 5. We had the lossy-compressed JPEG version of the image, and after we had attempted to remove some of the JPEG artifacts through Fourier Transform truncation and then deconvolved it with the point-spread function of the camera (the camera inherently blurs things a teeny bit), it looked like a crater, and I was pretty certain it was a crater. Since it was many pixels wide and the image had a pixel scale of 3.8 km/px, that is a significantly sized crater, at least 30 km in diameter. Except, it wasn’t. We have since gotten a mosaic at 2.2 km/px of the planet, and we have gotten higher pixel scale images at 400 m/px that have not yet been released. In none of these is that very large, very obvious crater present. We made a tiny artifact bigger by image processing. It was a simple cosmic ray hit. Cosmic ray hit the detector, meaning there was a very bright pixel with a lot of electrons in it. This detector has the annoying property that if you have a bright spot, a dark streak forms behind it. You can see this in all of the over-exposed hazards search images. So the bright pixel now had a dark streak behind it. This was lossy JPG compressed on the spacecraft by a severe amount. Heavy JPG compression can make things “ring” because it represents the data as a series of cosine waves. One of our basic image processors took that image and first deconvolved it, sharpening the ringing JPEG noise. He then looked at the image in frequency space and made a series of clips that when brought back into spatial space (what we’re used to) will dampen a lot of the obvious JPG blockiness and make for an image that is more aesthetic and helps to make out a lot more features because you don’t have the 8×8 grid of JPG blocks dominating. This is perfectly reasonable to do, and so long as you understand the kinds of artifacts that it can introduce and don’t over-interpret it, you’re fine. Unfortunately, it makes this particular kind of cosmic ray hit on this particular detector look like a very clear, very obvious impact crater. Despite my best efforts at not over-interpreting early images that clearly showed artifacts from the image processing, I over-interpreted this feature. Fortunately, it never made it into a press release or a paper (though I will be talking about it in a paper I’ll be writing as a cautionary tale), but when doing stuff like this, I’m always reminded of how (and this is going to sound arrogant) I’m different from a pseudoscientist, and how working on skepticism for the past (nearly) decade has helped me to become a better scientist. Someone like Richard Hoagland, Mike Bara, Keith Laney, or the guy I talked about in the last blog post probably would not hesitate to make a big deal out of these kinds of features. To be blunt, I’m a crater expert. I am considered to be an expert in mapping impact craters due to my experience at mapping over 1 million impact craters across 7 solar system bodies (so far). Yet, I made this significant mistake. What separates me from the pseudoscientist, though, is that when I was presenting this to people, I said that this looks very much like a certain crater, but we need to wait to see the uncompressed version of the image, and we need to wait for the higher-resolution maps before saying it’s certain. And if it isn’t, “it will be very interesting to figure out why it isn’t a crater.” I specifically said that in a team meeting on Sunday. Many things right now are provisional simply because of the very lossy image compression. Features like craters are particularly difficult to tease out, unless they are very large and very obvious (as are many). Contrast that with the people trumpeting “geometric structures” on Pluto and Charon in these images. Of course there are “geometric structures” that were “artificially created” … all in the lossy JPG compression algorithm! I keep thinking I’m repeating myself with this — and I am — but people still keep making this claim. This blog post is about minutia. But, it’s a topic near and dear to me because it’s been my research focus since late 2007: Impact craters. On December 10, 2013, Robert Morningstar – brought back onto Coast to Coast after appearing on their JFK conspiracy episode – made a claim about impact craters that is simply, completely, 100%, wrong. But, it’s one that I’ve seen made before, so here we go with the minutia blog post. Morningstar made the statement starting at 32:32 into the third hour of the program, and the text below is quoted through 34:38. What’s weird about Weird Crater* is that triangle, uh that I saw in the thumbnail, is formed by the impact of three meteors all of the same diameter. That is not a-really possible. And this is a really strange phenomenon on the moon, it’s called the “doublet craters.” Around– surrounding the moon, there are double craters, uh, that appear regularly — dot-dot, dot-dot, dot-dot — you know? And they’re both the same size. It’s not possible. What is possible is artillery [laughs] in my estimation, in my view. … That makes two craters of the same size. But, to think that three meteors in the same diameter could hit one zone, in one crater, uh and the doublet phenomenon, tells me that not everything is right with the interpretation of uh, of the selenologists. *Note: According to the USGS index of IAU-approved names, there is no such crater. I looked through all crater names beginning with “W” and the closest I found was Wyld and Wildt. There is nothing that has “rd” together that starts with “W” so either he is making this up, or the crater is not officially named that so I cannot locate it to examine it. While this is somewhat interesting, it is not actually relevant to the rest of this, though. To say “he’s wrong” would make this blog post short. And these days, unlike what my high school English teachers remember, I am much more verbose than that. First off, there are at least three theoretical reasons why you would expect “doublet” or triplet craters or even chains of impact craters (I’m just dealing with impact craters here, not other forms like chains of pit craters). 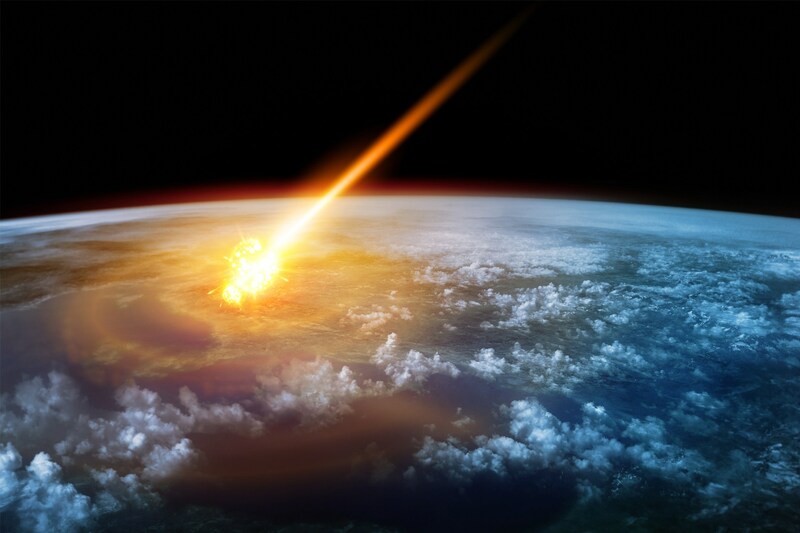 The first theoretical reason is that you have a binary or trinary asteroid that strikes a surface. Or a weak asteroid that was pulled apart from an earlier pass – or just before impact – by tidal forces and strikes the surface. This is expected, and we know that many smaller asteroids are very weak – the “rubble pile” model has come into favor these days that posits that many asteroids are actually re-assembled after previous breakups. This means that they will be pretty weakly held together, and a close pass by a larger gravitational body can rip it apart. Which brings me to the first-part-b theoretical reason – more evidence than a reason – for why you expect to see chains of craters: Bodies are ripped apart soon before impact and strike the surface like a shot-gun. Don’t think this is possible? What if Comet Shoemaker-Levy 9 had impacted a moon instead of Jupiter, and soon after its breakup rather than a few orbits later? You would get a crater chain. We see these all the time on satellites of the outer planets, such as in the example below from Ganymede. The second reason we would expect it is the phenomenon of secondary craters: Craters formed from the ejecta blocks of a primary crater that go off and form their own craters. These most often occur in clusters and clumps and chains. One need look no further than the area around the young and large Copernicus crater on the moon to see examples of these. Third is that it can easily happen by coincidence on older parts of the moon or any other object that’s already heavily cratered. I spent literally 10 seconds just now and found this region of the moon which shows several craters of very roughly the same size, some of them right next to each other. So, right there, three reasons and plenty of examples of why you would expect – and we do see – craters appearing in pairs or groups right next to each other. Another part of Morningstar’s claim is that the craters look to be the same size, which means they’re artillery fire. Sigh. This points to a profound ignorance of the cratering process in general. There’s not really a more polite way to say it. We graph crater populations most often in what’s called a “size-frequency distribution,” which is basically a log-log plot that puts crater diameter on the x-axis and number of craters on the y-axis. It’s often binned in SQRT(2)*D diameter bins, such that one bin might go from 2-2.8 km, then 2.8-4 km, then 4-5.7 km, then 5.7-8 km, etc. The reason is that on this kind of plot, crater populations tend to follow a straight line, starting in the top left and going to the bottom right. Bill Hartmann, one of the founders of the field, has probably the easiest public-access explanation of this. Or, you can go to the intro of my thesis, section 1.4.3, pages 16-18. That boils down to, as I said, Morningstar is apparently ignorant of the cratering process and craters in general. Not only do you expect to find many craters of the same size (in the Mars case, nearly 50,000 just in a 50-meter-diameter spread), but it would be weird if they weren’t like that. Except that’s not the case: Asteroids form impact craters. Probably >90% of the impact craters in the inner solar system. So, we can look at their size-frequency distributions” and – hey! – they match those of craters. I’ll repeat: What we think causes impact craters (mainly asteroids) matches the size distribution of the craters themselves. As opposed to artillery. Coast to Coast AM guests often say things that are just completely wrong. I often just shake my head. Earlier today, I was listening to an interview David Sereda gave, and almost literally nothing he said was true (I did a two-part podcast series on him — part 1 and part 2). In those cases, it’s so hard to know where to start, that I simply don’t. I don’t know much more than the average skeptic about the JFK assassination conspiracy. So, when Morningstar spent just a few minutes out of a three-hour interview saying things that were completely wrong about craters, well, I pounced.